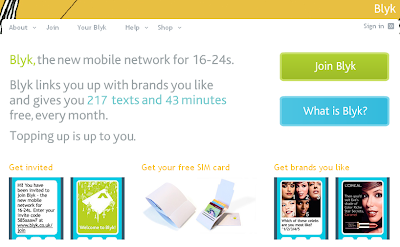 Blyk, the first mobile virtual network operator offering free phone call minutes and messaging in return for sending customers advertising, launches in the UK today. The network will target the ads based on a detailed profile customers will fill out on their website. To make sure the audience is the right one, only 16-to 24-year-olds will be allowed on it, with cross-checks for age in place. Advertisers, including Buena Vista, Coca-Cola, I-play Mobile Gaming, L’Oreal Paris, StepStone and Yell have already confirmed that they will be among the first advertisers. Blyk users will get 217 free texts and 43 voice-call minutes every month on condition they opt in to receive up to six ads to their phone a day. It’ll cost 99p per megabyte to browse mobile sites. Its going to be interesting to see whether Blyk's business model will work. Mobile advertising certainly has a great upside but I m not sure whether the free minutes and sms can ever be subsidized by the 6 ads that Blyk will be sending out to their users everyday. It may or may not work. It really depend on the successful conversion of the ads sent to the users and how much Blyk can monetize from the ads delivered. With an experienced team, headed by former Nokia president Pekka Ala-Pietila and Antti Öhrling, a branding veteran, I m sure they must have got something planned out. Lets not forget its not really an absolute free service to the end users as once they go past the free minutes and sms, the cost of each sms and call will be charged at 10p a text and 15p a minute and users have to prepay for the additional sms and call minutes. I reckon that they are going to be alot of takers as its not really a bad deal if you are one of those who does not mind giving up some of your particulars so as to allow Blyk to target you with 6 ads each day. I wish Blyk all the best.